Super Co-op Adventure is a quirky and surprisingly challenging co-op puzzle platformer where you help two uniquely skilled blocky characters make their way through a glitchy computer world. 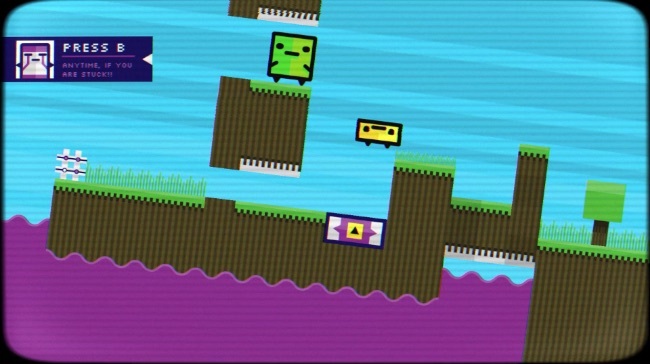 Playable in single player or in local co-op, in Super Co-op Adventure you take control of two little characters named P1 and P2, who are trying to escape from the EmptyNet to a better life in the ExtraNet. However, during their journey they end up crashing into an unstable version of the ExtraNet and must now use their unique abilities to escape. You can control P1 with the AD and W Keys and P2 with left and right mouse buttons. P2 can’t jump independently, but can act as a bouncy platform for P1, can squeeze into tight spaces and can hover through the air a little. P1 on the other hand is bigger, can jump and can cause mini-earthquakes when he falls from larger heights, causing secret passages to appear. P1 and P2 can assist each other in lots of different ways, often with the aid of special pads they stand on allowing them to do anything from teleporting to moving blocks in the game world. There are a few rough edges in the current build of Super Co-op Adventure, such as there being far too few checkpoints (a rewind function would be handy) and there’s a button mashing section that can be extremely hard in single-player. It’s an impressive game though. The visual style is very striking, it’s got a nice sense of humor and puzzle design in is very inventive, making great use of P1 and P2’s unique skills. A clever co-op puzzle platforming adventure across a glitchy computer world.